What Dr. Bedi has done is unique. He has combined Jungian psychoanalytic insight with his own finely-honed clinical intuition. This book invites and facilities the kind of simple but profound clarity of thought that helps us cope. It is the path to an island of peace in the turbulent, chaotic ocean of life, as we know it today. 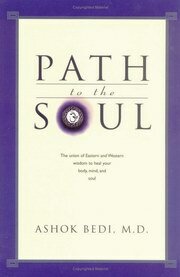 Dr. Bedi, in a sensitive and compelling manner, provides the reader with a map to explore a journey toward psychological and spiritual individuation and the Path to the Soul- "a sacred place where the soul lives." The book is definitely a labor of love, and a distiiation of critical, hard-headed research, experience, insight and inner struggle. For those who want to fully self-actualize, and are looking for a genuine, authentic, unpretentious canonical path, Path of Soul is it." Ashok Bedi, M.D., is a Clinical Professor in Psychiatry at the Medical College of Wisconsin and a faculty member at the Analyst Training Program-the Carl G.Jung Institute of Chicago. He specializes in Adult Psychotherapy and Jungian Psychoanalysis and regularly presents lectures and seminars in India, Great Britain and USA on the topic of the spiritual and analytic dimensions of treatment, healing and personal growth.